A members of North Shore High School FIRST Team # 3950 "RoboGym" preparing their robots during “RECYCLE RUSHsm” at School-Business Partnerships of Long Island’s 16th Annual Long Island Regional FIRST Robotics Competition on March 28 at Hofstra University’s David S. Mack Sports & Exhibition Complex in Hempstead. School-Business Partnerships of Long Island, Inc. (SBPLI) announced its award winners at the 16th annual SBPLI Long Island Regional FIRST® (For Inspiration and Recognition of Science and Technology) Robotics Competition at Hofstra University’s David S. Mack Sports and Exhibition Complex in Hempstead, New York. The event was held March 26-28. 1,275 students of 51 high schools from Long Island, the metropolitan New York area, upstate New York, Canada, Israel and Brazil participated in the competition. Teams received honors and recognition that rewarded design excellence, competitive play, sportsmanship and high-impact partnerships among schools, businesses and communities. With the hope of winning one of several coveted awards, high school students worked with professional mentors to design, program and build a robot over a six-week timeframe using a “kit of parts,” which consists of some materials that can be used in whichever way teams would like and a standard set of rules that helps teams manage quantity, type and the price of their materials. The students gathered to compete with their robots in this year’s game, “RECYCLE RUSHsm,” a recycling-themed competition played by two alliances of three robots each. Robots scored points by stacking totes on scoring platforms, capping those stacks with recycling containers, and properly disposing of pool noodles, representing litter. In keeping with the recycling theme of the game, all game pieces used were reusable or recyclable by teams in their home locations or by FIRST at the end of the season. 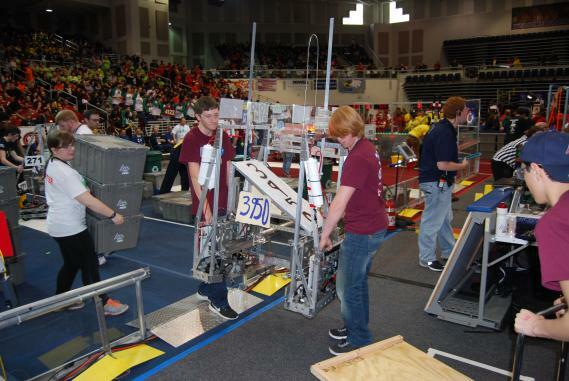 See the results of the 2014 LI FIRST Regional Robotics Competition. * The Chairman’s Award is the most prestigious award of the event and recognizes the team that embodies the goals and purpose of FIRST and best represents a model for other teams to emulate. ** These teams were eligible to participate in the FRC Championship that will take place April 22-25 at the Edward Jones Dome in St. Louis, MO. SBPLI named Ed Felix and Lynda Adams as its Volunteers of the Year. Winners of the Dean’s List Finalist Award were Christopher Meachum of Malverne High School FIRST Team #884 and Kevin Hatton of Center Moriches High School FIRST Team #4458. Savannah Legg of Longwood High School FIRST Team #564 received the Fred Breithut Award. Tom Boehm of Motorola Solutions, a mentor with Patchogue-Medford High School FIRST Team # 329 took home the Regional Woodie Flowers Finalist Award. This year’s sponsors included Hofstra University, FESTO Corporation, Stony Brook University, BAE Systems, Northrop Grumman, PepsiCo, SCOPE Educational Services, Estée Lauder Companies, Farmingdale State University, Cablevision, North Shore-LIJ Health System, Park Shore Country Day Camp and School, PSEG Long Island, Schenck Trebel Corporation and School Construction Consultants, Inc., among others. SBPLI is currently seeking local businesses for sponsorship opportunities for the 2016 Long Island Regional. For more information, please visit www.sbpli.org. This was covered by Optimum: "Neighborhood Journal"